Uncontrolled EU migration costs Britain financially and increases the strain on public services, resulting in a lower quality of life for many Britons and a less generous nation. Understanding the importance of migration to EU policy formulation is simple, not complicated. Migration is easily understood by this: in the short run, mass uncontrolled migration affects incentives. In the long run, it powers demographics. The UK’s current migration policy makes for a borderless Britain, where immediate access to UK housing, public services and labour markets is open, without notice of intention to come, to hundreds of millions EU citizens. This impacts economic incentives across the board in the short run and completely changes our country’s demographics in the not-so-long-run. As a result this has slowly but surely become a bigger issue as EU migration has increased. Unfortunately, recent evidence suggests that our great institutions of the state – new and old – don’t get it. Our historic treasury, for example, sits up like a dog looking for a performance titbit from this new-fangled thing, the Office for Budget Responsibility (OBR), the output of which is now the fulcrum upon which economic statements of intent are judged. The OBR, in turn, has shown itself woefully unfit for purpose when it comes to both predicting and analysing the effects of migration on UK economic policies, public services, finances and infrastructure. 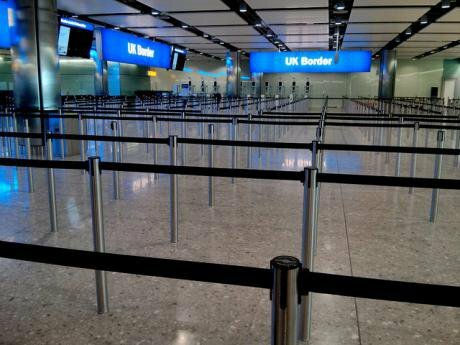 For several years it consistently used ludicrously low UK net migration numbers in its forecasts – from 105,000 a year to 165,000 – when the actual quarterly figures were growing so fast they were the cause of a political maelstrom and now sit at 300,000+. On the income side of Britain’s national accounts, the OBR consistently predicts increased immigration will provide a boost in tax receipts and a fillip for potential output growth. On the expenditure side, the OBR’s stance on how the costs of infrastructure projects and public service provision are affected by its small upward revisions of this critical immigration number is still unclear. If GDP is the only measure then of course it will rise if you keep expanding the population. What open door migration proponents never concede is the fiscal cost of immigration. It is the indigenous taxpayer that has to pay for the infrastructure costs of building all the new schools or roads or for benefits (in work or out of work). In reality, a nation’s demography is its destiny. The UK population is rising rapidly. We have no real way of knowing with precision how many people are here, but we can all agree that the numbers are growing fast. Our public services are creaking at the seams. Doctor and hospital appointments are becoming harder to get, and increasing numbers of GPs are closing their lists to new registrations. Schools are faced with educating increasing numbers of children whose first language is not English, and pupils having to travel miles because local schools are overcrowded is well documented. As for housing, rents are accelerating upwards and the chance of buying a house is almost impossible for many unless we destroy our green belt and build a million homes in just a few years. Beyond that we have to face the reality of life in the third most densely populated country in Europe. If you live in England you live in the most densely populated nation in the EU. For those of us who are proud of Britain's history of tolerantly accepting those who face egregious inhumanity from governments in foreign places, a borderless Britain is a depressing place. Growing net migration numbers have a detrimental effect on our national character. Traditional British sympathies for refugees fleeing war torn countries are being blunted by 'migration fatigue' amongst British people who are not so accepting of millions of economic migrants. If EU rules didn't mean we have to take millions of economic migrants, it is clear that we would be in a better position to offer more places to refugees from war torn regions during the recent crisis’s we have seen. In this way, EU migration rules are making Britain a less generous country. This is something that the progressive thinkers, who always try to stake out the moral high ground of British politics, fail to understand because their wishful thinking is not grounded in reality. So when it comes down to it the only way for a British government to take to take back control of Britain’s borders is by voting to leave. This is why migration is such a critical issue in the EU referendum debate and, along with our national and economic security, it is why we are better off outside of the European Union. The people of Britain have become exhausted with the broken promises and lack of aspiration in the approach to migration by the European Union. Unless, we vote to Leave and take back control of our borders, people will increasingly lose faith in the ability of their elected representatives to make a difference to their everyday lives. They will continue not to have the power to make the changes they want as such powers will still be in the hands of unelected, bureaucratic EU officials, who at end the end of the day don’t have British interests alone at heart. 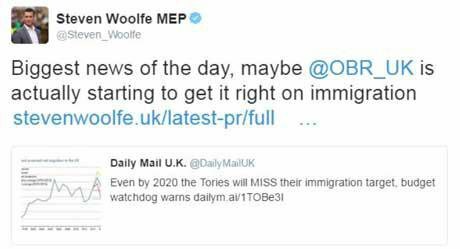 As I put the final touches to this article the OBR seems to have reacted to UKIP’s public criticisms of its work and begun to really assessing immigration’s impact on the economy (see my tweet below). If the OBR is right and the government will miss their migration target even by 2020, the implications for Britain’ public services and infrastructure are even more serious than mentioned above if Britain does not leave the EU and implement a managed immigration policy for the UK. We must continue to hold the OBR’s feet to the fire on this integrity issue, as we have already seen from the recent budget that the chancellor will use the OBR’s output in deceitful ways to bolster the argument of those who want us to remain in the EU.